Michelle Hamilton is a Multi-Dimensional Healer who works with Women to unblock the physical, emotional and spiritual blocks that are creating obstructions between where women want to be and where they really are. Michelle is passionate about whole-body wellness and uses multiple tools to help you achieve optimum wellness in your life. She founded and conceptualized Well Woman Retreats as she noticed a common theme among her female patients: over-worked, with a complete disconnect to their physical bodies. She created these retreats to provide a safe container for all women to create the healing shifts that are necessary for women to live the joyful, authentic lives we were meant to live. Michelle completed her undergrad at Cal Poly then chose to study Traditional Chinese Medicine at Emperors College in Santa Monica, Ca. Over the course of her acupuncture training she had the opportunity to intern at the UCLA Medical Center and graduated with academic honors. She has a successful acupuncture practice located in San Luis Obispo, Ca where she specializes in Women’s Heath, Orthopedic Injuries and Psycho/Emotional Issues. Michelle is a State Board Certified Acupuncturist, Herbalist, and Massage Therapist. She has completed Tiffany Carole’s Master Healer program and has completed many post-graduate trainings in aroma-acupoint therapy, women’s health/infertility, pediatrics, functional medicine, and sports medicine. She has maintained a private practice out of the SLO Wellness Center and has most recently opened her second clinic, Zen Den SLO. Zen Den is sliding scale community acupuncture clinic located in downtown San Luis Obispo. I was first exposed to yoga at the age of six at a Montessori School where I grew up in Scottsdale AZ. Through my young adult life, I continued to be exposed to yoga and it seemed that yoga was always manifesting stability and joy. I began my training when I was 23 after injuring my back on the Fire Department. I started my focus on Kripalu and Iyengar yoga. Through this fullness and healing I continued my yogic journey seeking out workshops throughout Arizona and California where I was able to gain a depth of understanding and experience that I live for sharing now. I completed my 200 hour RYT with YogaWorks here at the Yoga Center in San Luis Obispo with Malachi Melville and Greville Henwood in 2010. I was naturally drawn to yoga for the sense of peace, calming, healing, and belonging it brought to my spirit since childhood. I enjoy teaching and practicing strong, vinyasa flow style Yoga classes as well as blissful restorative ones. I share my passion for life and joy by sharing yoga with spirits of all ages. Lou has been changing lives in the health and fitness industry for over 25 years. She holds a Bachelor's of Science (Biology) from The University of North Carolina at Chapel Hill. In addition she holds training certifications from The American Council on Exercise and Grey Institute's Applied Functional Science, as well as a Health Coach certification from The Institute for Integrative Nutrition. Lou's health and fitness passion grew as a high level competitive athlete. She was member of both the National Championship, University of North Carolina women's soccer team and the U.S. Women's National soccer team. This is where her passion, and gift, for bringing health and wellness into people's lives began. She has worked with people of all ages and abilities in a wide range of areas from sports specific athlete training, weekend warrior training, injury recovery and also helping that person who just wants to move a little easier and feel healthier. Through Lou's ability to listen to and connect with her clients and colleagues she has built a very successful career. Her goal is to create a safe environment and personal relationship that will help guide people to achieve their goals. It is this love and passion for helping people realize their potential that she has brought to the San Luis Obispo area for the past 10 years. It is with love and passion that she is very excited to continue to educate and inspire our community to live the fullest and healthiest lives they can. 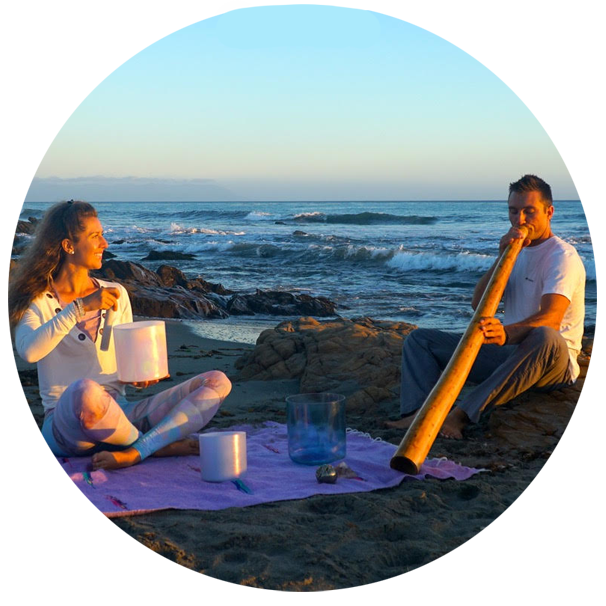 Let’s Get Tuned is a sound healing movement started by Natalie Teichmann and Jon Nowaczyk. It was love at first tuning with this duo. Jon and Natalie are passionate about sharing the rest and relief that sound baths provide with everyone. They encourage you not to think about it, but to feel about it as sound waves wash over you and replace stress with bliss. The highest quality sound instruments coupled with loving intentions and reiki energy make for a perfect sound healing experience.